We've been enjoying our new adventures in letterboxing, so we scheduled a day trip to Williamsburg one beautiful Fall day and visited Waller Mill Park. There were a number of letterboxes hidden along the Bayberry Trail there, so it was the first time we had more than one letterbox at a place. Lots of fun! We ended up with finding seven (7) of them. 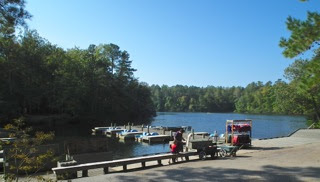 The park was really pretty with views of the lake along the trail and they had rentals for paddle boats, canoes, and kayaks. There was a small playground and picnic shelters and even a place for baseball. I love to see parks like this knowing it provides families an easy escape from city life. It's a 2705-acre city park situated around a reservoir (which I've called a lake). There are several trails including a paved one for bikes. We took the Bayberry Trail which was about 2 miles. We thoroughly enjoyed our time there (2-1/2 hours) and even though it was a Saturday, we saw hardly anyone on this trail. We did get to meet some critters while looking for letterboxes. A Black Rat Snake was my favorite and Randal actually spotted him. Saw a number of mushrooms too. View the Waller Mill Park photo album.